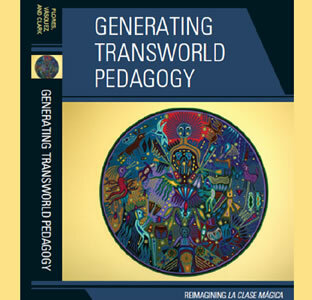 (March 19, 2014) -- The UTSA Department of Bicultural-Bilingual Studies and the Academy for Teacher Excellence in the College of Education and Human Development (COEHD) will present their book, "Generating Transworld Pedagogy: Reimagining La Clase Mágica," at 7 p.m., Friday, March 21 in the Durango Building Southwest Room (1.124) at the UTSA Downtown Campus. >> The presentation is free and open to the public, but attendees are asked to register online for the event. "Generating Transworld Pedagogy: Reimagining La Clase Mágica" takes an in-depth look at the last five years of La Clase Mágica, an after-school program sponsored by the Academy for Teacher Excellence (ATE) that brings together bilingual teacher candidates and bilingual elementary students in low-income schools. The program is designed to help bilingual students acquire new knowledge literacies through the use of digital technologies. La Clase Mágica at UTSA is based on a similar program developed in San Diego, Calif., by Olga Vásquez, associate professor at the University of California, San Diego and co-editor of the book. "Our book demonstrates the utility of La Clase Mágica in terms of methodologies that engages learners in the process of active knowledge acquisition," said Belinda Bustos Flores, professor and chair of the Department of Bicultural-Bilingual Studies and co-editor of the book. The book is the result of three years of collaborative work between the Department of Bicultural-Bilingual Studies, ATE, and colleagues from other countries and universities, and features chapters written by several COEHD professors, including Flores, Ellen Riojas Clark, Patricia Sánchez, Timothy Yuen, Maria Arreguín-Anderson, Iliana Alanis, Lucila Ek, Margarita Machado-Casas, and Lorena Claeys, director of ATE. The book also includes research conducted by COEHD graduate students. The presentation will feature a special traditional Aztec dance, Ceremonia Náhualt a la Sabiduría Sagrada, performed by Danza Azteca Xinachtli. The event will include a book signing by the authors and a reception. For more information, contact the Academy for Teacher Excellence at 210-458-6170.